I tried it both on and off. Thanks though! I ended up having to have the phone replaced. Ive had the same pb and they said i have it to return it to samsung factory. They will try a software update that should fix the pb. It is a shame because apple would pick up the phone at home whereas with samsung i have to send it myself and pay the postage for a brand new s8 + bought one month ago. I also encountered other disfunctionnings: tel loud speaker getting blocked. Great if suddenly you need confidentiality. I am very disapointed by samsung and promise i will change to apple asap. UPD. They said: avoid sudden movements during shooting because of stabilization. Glad to hear it! If you still see this occasionally, that would still kind of point towards a hardware problem, but it's hard to say exactly where the problem is over the internet. If it starts to get worse again, I'd definitely talk to your carrier or Samsung to check out warranty options, but in the meantime I hope you enjoy your phone! Feel free to reach back out if you have any other questions. SOOO many forums about this glitch. Each with slightly different verbiage, but the problem is the same. I have the same issue with my S8. The SLIGHTEST movement causes photos to be blurry. This is incredibly frustrating. I have adjusted & manipulated all camera functions, hoping to solve the problem, to no avail. I believe the problem is software based. The shutter speed is too slow. When in the "pro" mode, you can "adjust the shutter speed"... which only darkens your image. It's almost as if they accidentally programmed the exposure rate under the shutter speed icon. ... but again, it's only adjustable in "pro" mode. Which is not a default mode, thus, resets after a few uses. The shutter speed should be at it's highest rate AT ALL TIMES, as a standard function. I too, had an S6 & the photos were amazing! Very crisp images, even with a moving subject. 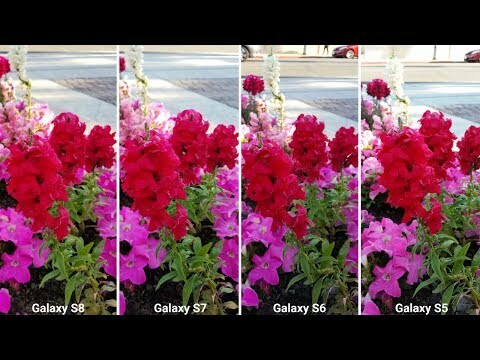 I understand the S6 had a higher quality camera (16 megapixels, compared to the 12 on the S8), but that doesn't explain the lack of camera/image stability. So far, I'm severely regretting "upgrading" to the S8... all because of the camera "quality." I'd like to request a Samsung tech look into the shutter function & speed. Especially, the difference between the shutter speed on the S6 vs the S8. I'm very concerned that this problem will go unaddressed, given it took 57 pages of posts for Samsung to roll out a patch for the sd card mounting issues. The camera quality forums are substantial in quantity, yet have fewer posts (with more "views"), which I fear will result in ranking lower on the totem pole, as far as which glitches Samsung addresses and/or patches. I've attached a screenshot from the following website as reference. Please watch this video. It explains, in detail, the issues with the S8 camera functions. Mainly the "aggressive noise reduction", resulting in blurred images. It specifically references the difference between the S6 & S8. PLEASE patch this issue. There's been over 2000 views on this forum, alone. Clearly, this is not an isolated issue. Really sorry @Anonymous for not getting to this sooner. It never popped up on my feed, and thankfully someone pointed it out to me. So going by what I see left from the OP, and the video you linked, it would almost seem slightly like two separate problems. The first image posted on this was extremely blurry in general, and didn't even seem to have any kind of focus at all. For those I've seen in other threads recommending a nice shake of the device, and it working, it makes me think more towards hardware. That being said, there is something there in this video that I would like to try and get more information on. That would be the noise reduction they were talking about and showing in comparison with the other 3 phone's cameras. In some of those images it's clear to see just how hard any noise is smoothed out, and I couldn't even tell how it judges what needs to be smoothed or not, since the one with the car was really nice. I know the blurry image itself was something I had reported, due to the focal point on some images being EXTREMELY narrow. I have not heard back anything in reference to that specifically, but I will update it again in my e-mail with this thread as well, and the new information. For @userGXXWQwmlzP, you did try messing with toggling off the auto-focus and with the outdoor settings, right? I don't think it is a software issue at all for many reasons, first- I tried it without softwares and the blurr still existed and it wasn't focusing. Second- I shaked the phone gently and the problem was resolved!! Which means the lens was stuck! However, after few days the problem came back and I had to shake it again, and it worked again! But that's really frustrating! I am afraid that will spoil some hardware if I keep doing that! Keep in mind that when it is working, the focusing is so great and effecient and working for far and near objects perfectly. I am glad I have one year warranty, as I will try to contact Samsung center here in Berlin, however, it is really sad that I am facing this problem especially that I just bought it!